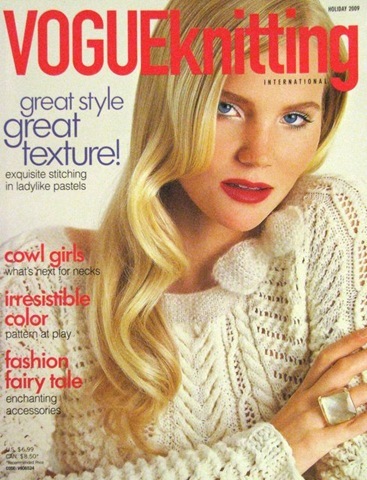 We now carry a large selection of magazines, including VOGUEknitting. The holiday issue has just arrived, featuring numerous projects and ideas. 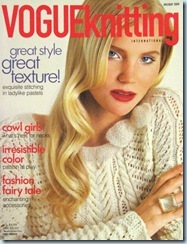 Are you a “cowl girl”, because, if you are, this issue has a great selection of cowls: the latest projects for necks. We particularly love the collared cowl, stitched in a circular knit/purl pattern and crowned with a ribbed turtleneck. Misti Alpaca’s Chunky makes this a perfect winter knit to keep warm through the winter months. But, that’s not all, this magazine has loads of other great ideas…stop by and see for yourself. We also carry knitsimple. This edition has great ideas for holiday gifts including quick and simple stocking and ornament ideas. And, last but not least, we also have a great selection of Interweave Magazines, including Holiday Gifts, Cozy Knits, and weekend. This entry was posted on Friday, November 20th, 2009 at 9:34 pm	and is filed under Uncategorized. You can follow any responses to this entry through the RSS 2.0 feed. Both comments and pings are currently closed.